In the first part of this three-part series, What Drives Real GDP Growth?, I identified four themes which drive real GDP growth. These themes are based on 19 socioeconomic indicators whose average Spearman and Pearson correlations to real GDP growth were statistically significant and greater than 0.2 across the 188 country sample. 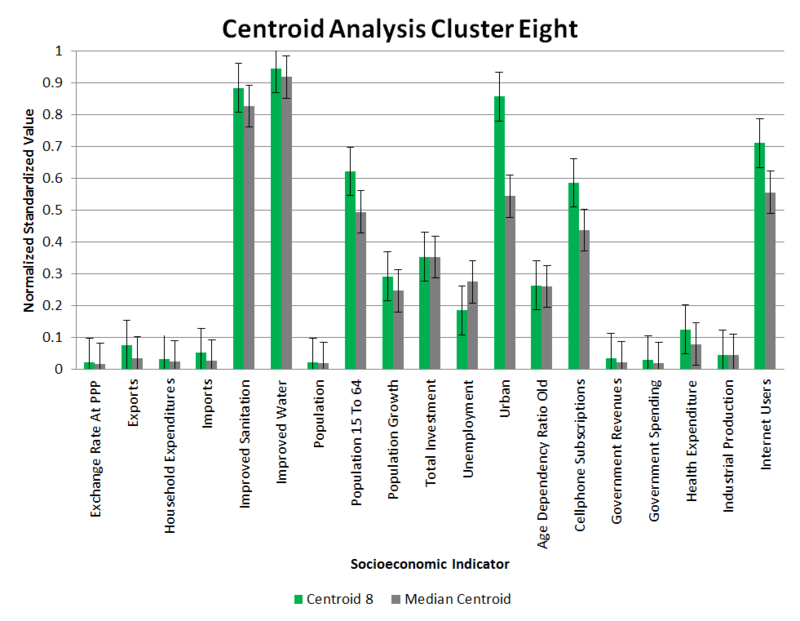 In this article the 188 countries are clustered based on those 19 socioeconomic indicators using a Monte Carlo K-Means clustering algorithm implemented in Python. Clustering can help to reduce the amount of work required to identify attractive investment opportunities by grouping similar countries together and generalizing about them. 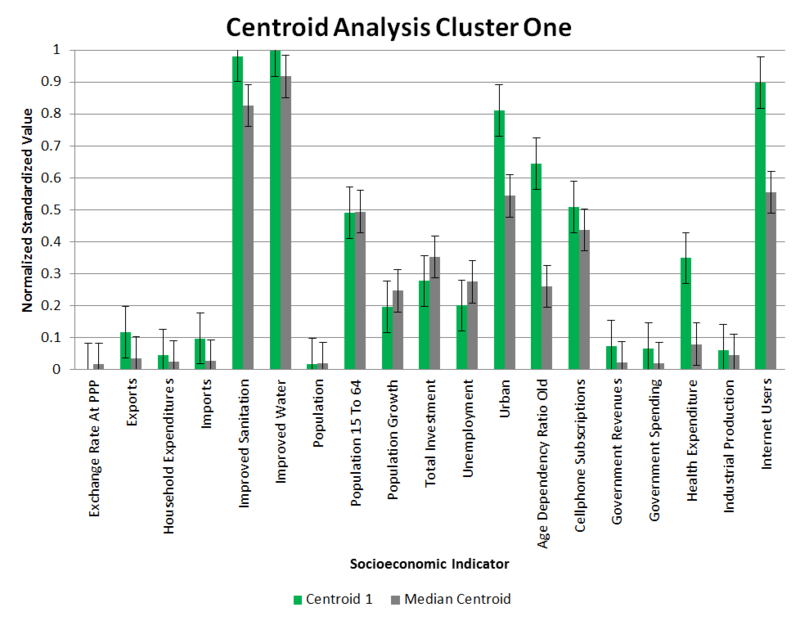 This article goes into sufficient detail about distance metrics, measures of cluster quality, clustering algorithms, the K-Means clustering algorithm, before discussing the results from clustering the countries and drawing conclusions. If you are quite comfortable with the topic, feel free to navigate to those sections which sound interesting. Appendix A - All the code and some data! Clustering is the process of partitioning a set of heterogeneous (different) objects into subsets of homogeneous (similar) objects. At the heart of cluster analysis is the assumption that given any two objects you can quantify the similarity or dissimilarity between those objects. In continuous search spaces distance measures similarity. Below I have written about similarity metrics for continuous search spaces. For each I have included formulas (Given two vectors, and ) and Python code. All the Python code used to write this article is available. Notice that when , we get the same value as using Manhattan distance and when we get the same value as using Euclidean distance. Now if Manhattan distances perform better than Euclidean distances in high dimensional spaces it implies that for values performance may improve still further. The paper I mentioned earlier found that at 20 dimensions performance of the fractional distance metric converged after . During this study I had no luck using the Fractional Distance metric. My (unproved) hypothesis is that the performance of the Fractional Distance metric is sensitive to the scale of the values in the vectors being clustered. One can also use correlations as a measure of similarity for continuous valued search spaces. Popular measurements include the Pearson coefficient, cosine similarity, and the tanimoto coefficient. If your data is not continuous i.e. it is discrete, then you can either use a function to convert it to a continuous space or us metrics such as Hamming Distance, the Jaccard Index, or Levenshtein Distance (for strings) to measure similarity. The Similarity class written below contains implementations of all the distance metrics mentioned above. The default value for fractional distances is currently set to 2.0 (Euclidean distance) but can be adjusted. The two main classes of clustering algorithms are hierarchical clustering and partitional clustering. Hierarchical clustering forms clusters by merging small clusters into larger ones or dividing large clusters into smaller ones. Partitional clustering forms clusters by dividing the input data set into mutually exclusive sub sets. The differences between hierarchical and partitional clustering mostly has to do with the inputs required. Hierarchical clustering only requires a similarity measure whereas partitional clustering may require a number of additional inputs, most commonly the number of clusters, . Generally speaking, hierarchical clustering algorithms are also better suited to categorical data. There are two types of hierarchical clustering namely agglomerative clustering and divisive clustering. Agglomerative clustering is a bottom-up approach and involves merging smaller clusters (each input pattern by itself) into larger clusters. Divisive clustering is a top down approach which starts with one large cluster (all of the input patterns) and divides them into smaller and smaller clusters until each input pattern is by itself in a cluster. In this article we will focus on partitional clustering algorithms. The two main categories of partitional clustering algorithms are centroid-based clustering and density-based clustering. This article focuses on centroid-based clustering; in particular the popular K-means clustering algorithm. The K-Means Clustering algorithm is a centroid-based partitional clustering algorithm which works using the mean-shift heuristic. 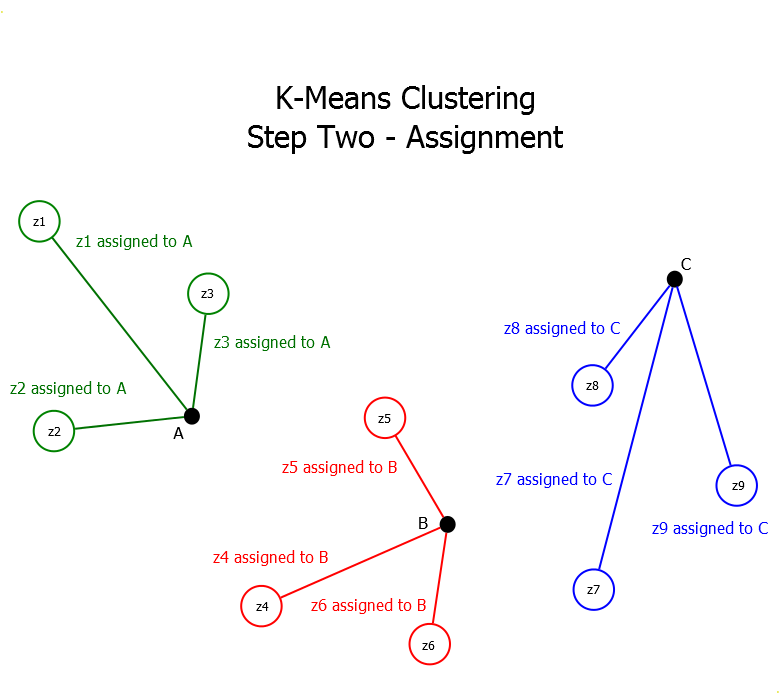 The K-means clustering algorithm consists of three steps (Initialization, Assignment, and Update). These steps are repeated until either the clustering has converged or the number of iterations has been exceeded a.k.a the computational budget has been exhausted. Once the centroids have been randomly initialized in the space, we iterate through each pattern in the data set and assign it to the closest centroid. Try and do this step in parallel, especially if you have a very large number of patterns in the data set. The Python methods below are extensions to the Clustering class which allow it to perform the K-means clustering algorithm. This involved updating the centroids using the mean-shift heuristic. Assuming you have a measure of similarity and a clustering of the data, you still need an objective function measures the quality of that clustering. 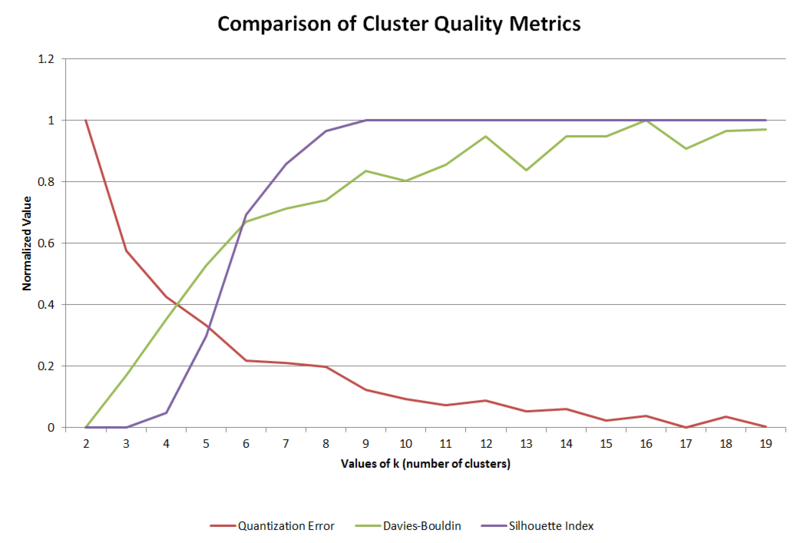 Most clustering quality metrics try to optimize the clustering in terms of its inter and intra-cluster distances. 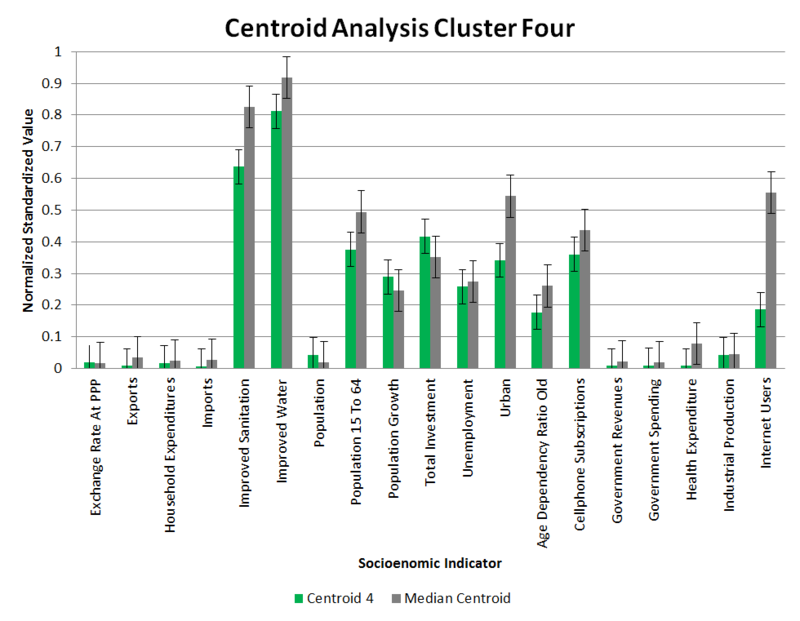 Put simply these metrics try to ensure that patterns in the same cluster are close together and patterns in different clusters are far apart. 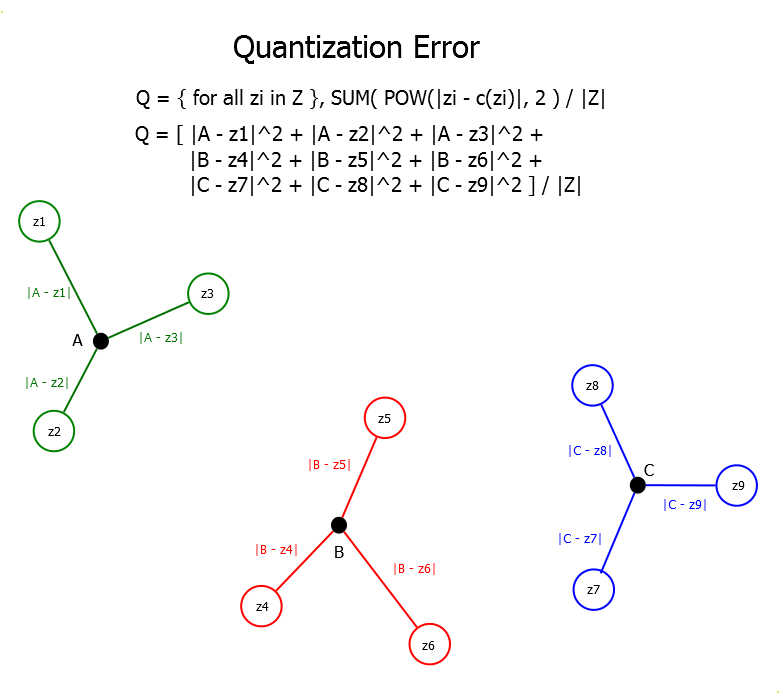 Quantization error measures the round off error introduced by quantization i.e. mapping a set of input values to a finite smaller set. This is basically what we are doing by clustering patterns into clusters. where is the set of data points we are clustering and just means we want to take the norm of and square it. So what this means is that quantization error is assuming we are using the Euclidean distance metric. where i.e. the number of patterns in the data set, is the pattern in , is the centroid to which is closest, and is the absolute distance between and using some distance metric, . Note: The image also assumes we are using the Manhattan distance. In the above illustration of the Quantization Error we are calculating the sum of the squared absolute distances between every pattern and the centroid it has been assigned to. is the ratio between the and cluster in the data. , is the average distance between each pattern in the cluster and the centroid of that cluster; and is equal to the distance between the and centroid. The Davies-Bouldin index is the sum of the worst intra-to-inter cluster distance ratios over all clusters. Note: The image assumes we are using the Manhattan distance. 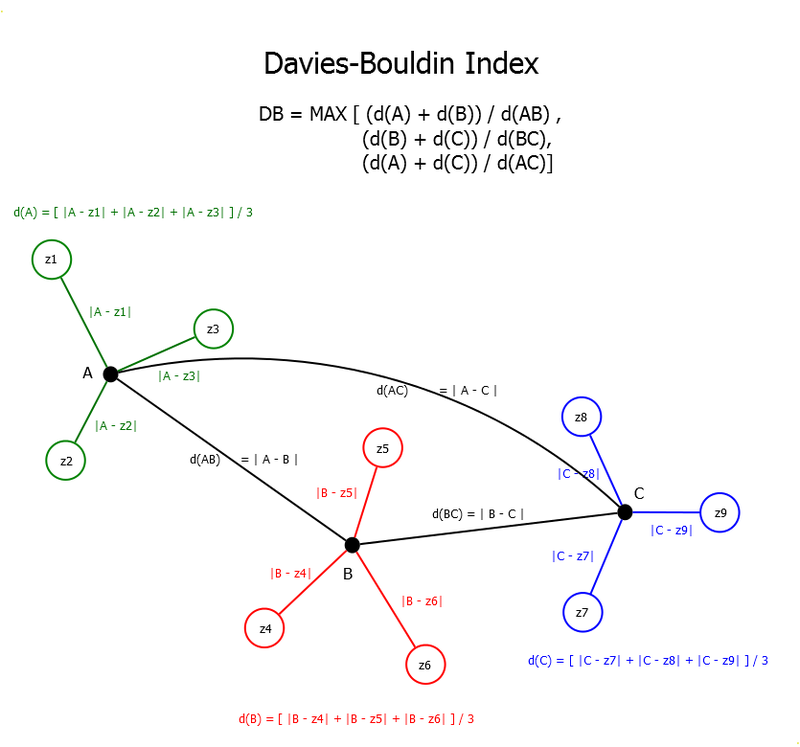 In the above illustration of the Davies-Bouldin index we have three clusters consisting of three patterns each. The first step is to calculate the average intra-cluster distances for each cluster . The next step is to calculate the distances between each pair of centroids, . Lastly we return the maximum ratio of the sum of any pair of intra cluster distances and the distance between those two centroids. The Silhouette Index is one of the most popular ways of measuring a particular clustering's quality. It measure how similar each pattern is to the patterns in it's own cluster as compared to patterns in other clusters. for a pattern then to the patterns in a different cluster (minimized over clusters), and is the average distance from pattern to the patterns in the same cluster as . A high silhouette value indicates that is well-matched to its own cluster, and poorly-matched to neighboring clusters. One should aim to maximize for each pattern in the data set. In the above illustration of the Silhouette index we have the same three clusters consisting of the same three patterns each as in our last image. This image shows how to calculate the Silhouette index for just patterns and . In the first step for both we calculate the average distance from each pattern to the patterns in its own cluster and . Next we calculate the average distance from each pattern to the patterns of the next closest cluster, the distances between each centroid will naturally decrease on average. Because this term is in the denominator you end up dividing by a smaller number for larger values of . The result of this is that the metric is biased towards solutions with a smaller number of clusters The Bad. 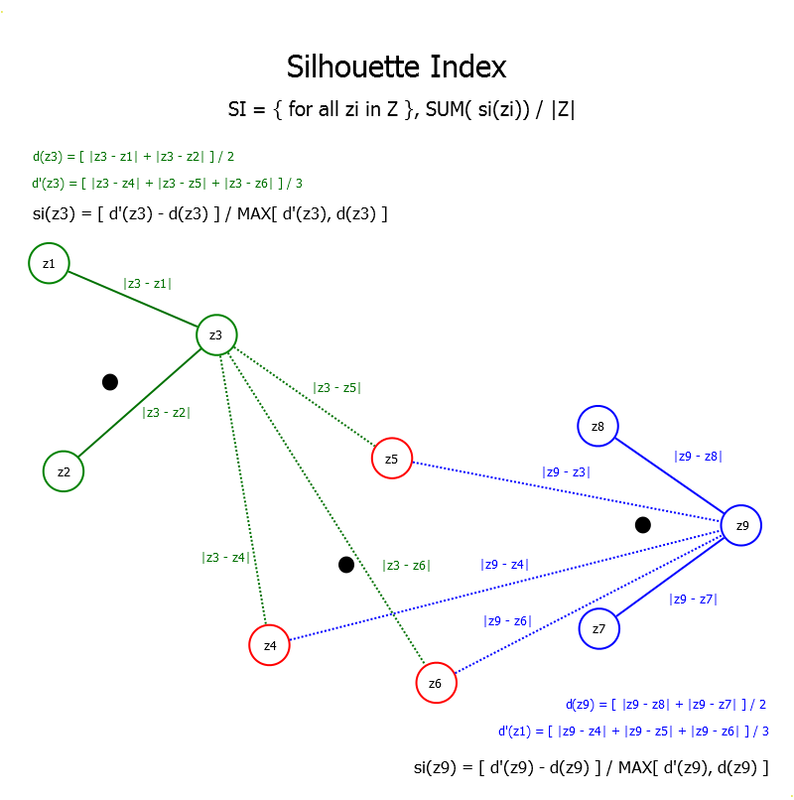 Silhouette Index - the computational complexity of this metric is crazy. Assuming you calculate the distance from each pattern to every other pattern to calculate which cluster is the closest and you do that for each pattern, you need to calculate distances. In this example that equates to 35,156 calculations. If you memoize perfectly the number of calculations for each pass is halved. Also, the metric seems to be biased against solutions with a larger number of clusters because, as you might have guessed, the distances between the centroids is smaller so each pattern is more likely to belong more to a neighboring cluster The Ugly. The following analysis of the different metrics demonstrates the biases quite nicely; despite the fact that they are supposed to be measuring the same thing they are almost perfectly negatively correlated. Before you can evaluate the fitness of a given clustering you need to actually cluster the patterns. The Clustering class contains methods which assign patterns to their nearest centroids. The ClusteringQuality class measures the quality of a given Clustering of the input patterns. 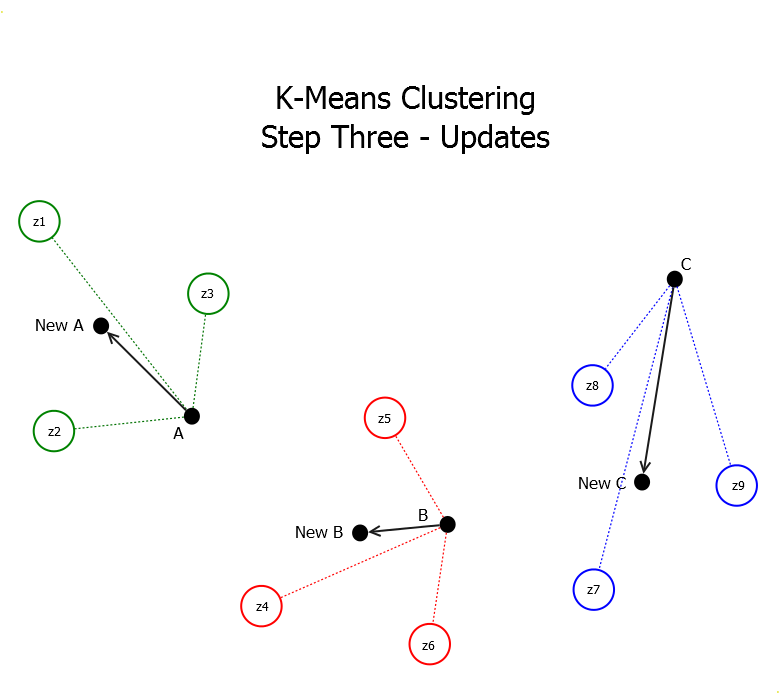 For these reasons it the K-means clustering algorithm is often restarted multiple times. Because the initialization is (usually) random we are essentially sampling random high-dimensional starting positions for the centroids which is also known as a Monte Carlo simulation. In order to compare solutions across independent simulations, we need a measure of cluster quality such as those discussed previously. I said that the initialization is usually random because there are deterministic initialization techniques for the K-Means clustering algorithm including grid-based initialization and principal component based initialization. For stochastic (random) initialization of the centroids one can either use pseudo random numbers or quasi random numbers. The difference is that the next random number in a pseudo random sequence is independent of the previous random numbers whereas in a quasi random number sequence the next random number is dependent on the previous random numbers. Dependent random numbers cover a greater surface of the search space. In addition to testing different initializations, we can test different values of in a Monte Carlo framework. Currently there is no optimal way of dynamically determining the right number of clusters, although techniques for determining the right value are always being researched. I prefer to just empirically try different values and compare the results although this is time-consuming, especially on large data sets. The final results presented below represent the best clustering found over the range over 1,000 independent simulations per each value of . Euclidean distances and the Quantization Error were the distance and quality metric used in the Monte-Carlo K-Means clustering. The data set used to produce the results was the normalized point-in-time 2014 data-set consisting of the 19 socioeconomic indicators identified as being positively correlated to real-GDP growth. These were identified in my previous post, What Drives Real-GDP Growth?. When viewing the results keep it in mind that the number of each cluster is arbitrary so being in cluster one may or may not be better than being in cluster two. In other words, it is an nominal scale. The following map represents the best possible clustering for based on normalized 2014 socioeconomic data. 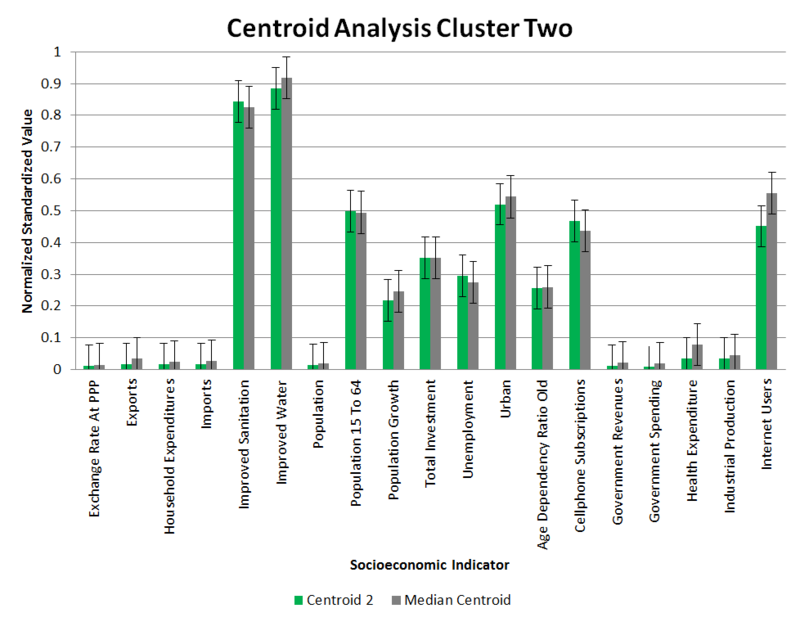 The centroids are broken down in the Cluster Breakdown & Centroid Analysis sub-section. 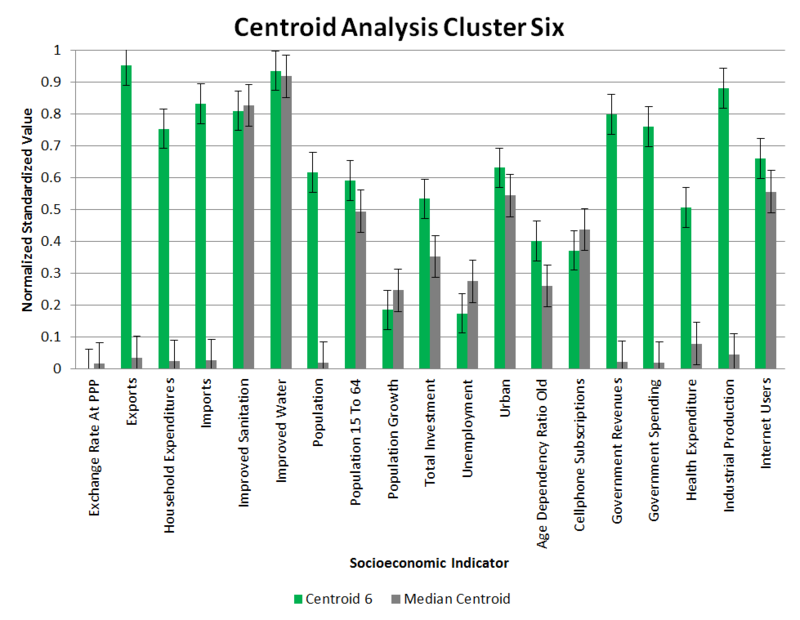 The following map represents what the countries would have been clustered on if 2004 data were used and the same centroids identified in the 2014 data were used to cluster the countries. 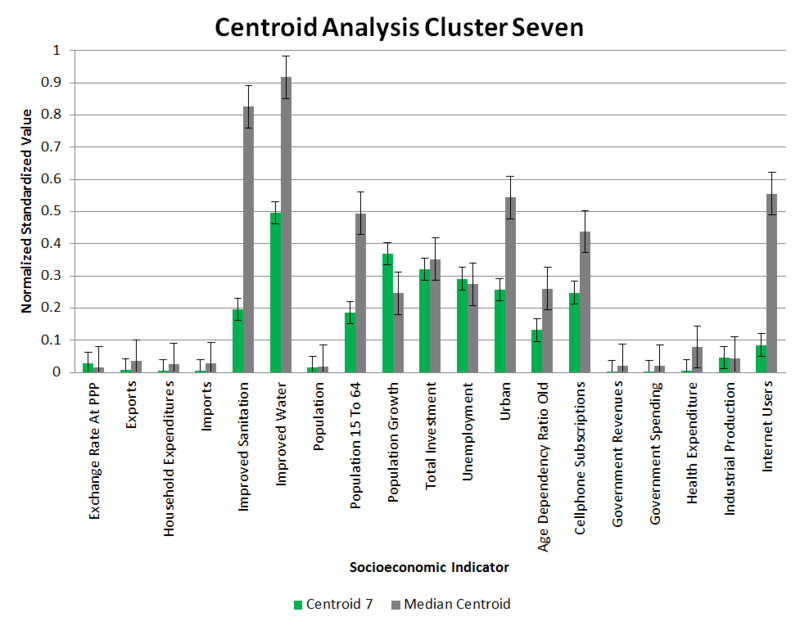 Each one of the tabs below breaks down the cluster into the country which belong to it and compares the centroid to the median centroid across each one of the 19 socioeconomic indicators we clustered on. 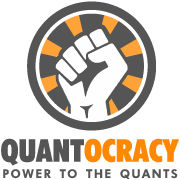 Being a quant is not about risk management, derivatives pricing, or algorithmic trading; it is about challenging the way things are done and finding better ways of doing them usually using statistical and computational methods. This way of thinking can be applied to anything including how we think about the world. I started writing this series of articles because I was frustrated by the use of over-simplified buzzwords such as 'The African Growth Story', 'Third World vs. First World', and 'BRICs nations' to describe topics as complex as the world and growth. The conclusions below have presented me with a better framework for thinking about the world and growth; my hope is that it will be as useful to you as it is to me. Many companies adjust their strategies according to regions of the world. What the results suggest is that countries in regions of the world are as likely to be clustered together as they are not. This would indicate that as a crude clustering technique, seeing the world as regions of similar countries with similar growth prospects is sub-optimal. Eastern vs. Western Europe - There appears to be a clear way distinction between those countries in cluster one versus those in clusters five and two. The past ten years have seen changes in Spain, Ireland, the Czech Republic, and other nearby countries. This is probably the result of the sovereign debt crisis. 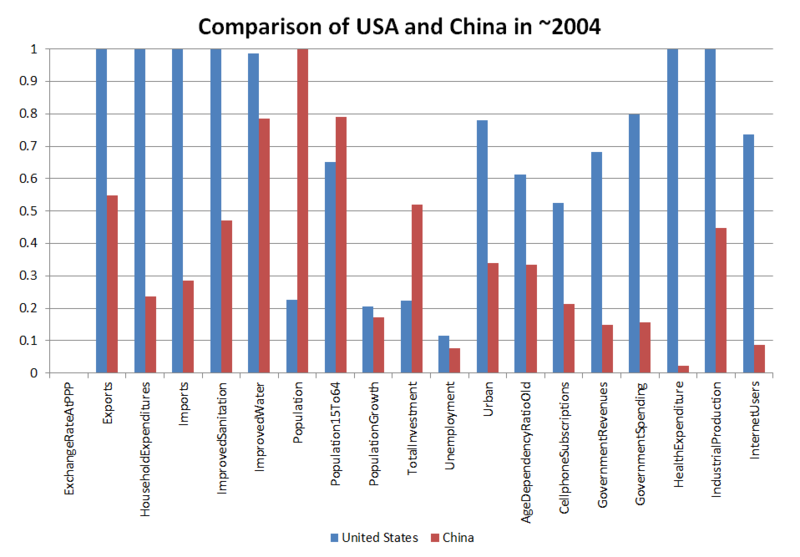 Eastern vs. Western Countries - This is an over-simplification. 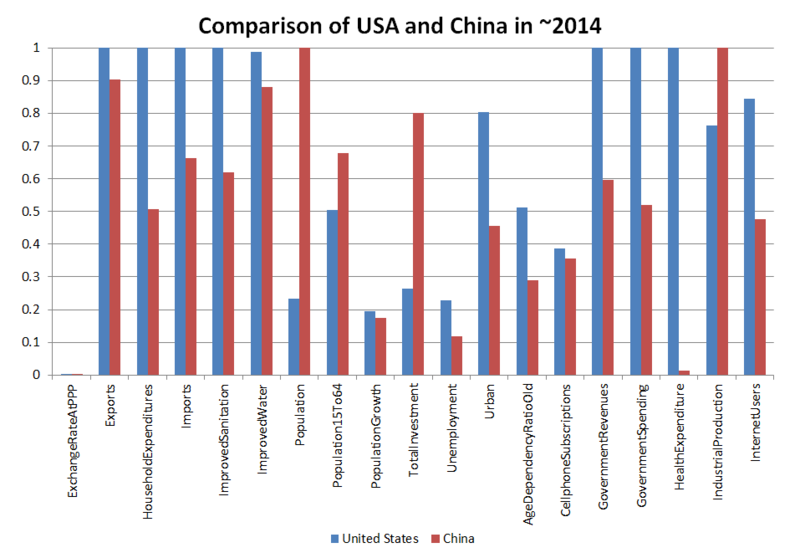 Most Asian countries occupy different clusters, and the traditional Western countries such as the USA and the UK do not actually occupy the same cluster. BRICs nations - Brazil, Russia, India, China, and South Africa are in different clusters. Whilst they may have trade agreements in place, that doesn't imply that these nations have the same social, demographic, and economic make-up or the same potential for future real-GDP growth. The African Growth Story - Whilst capital markets have done well in the past ten years, this does not seem to have reflected in major changes to the social, demographic, and economic make-up of the continent. What is interesting is that India and Pakistan are no longer clustered with Central and Southern African countries. Northern Africa vs. Southern Africa - There is a clear distinction between Northern African countries (Morocco, Algeria, Egypt, Libya, etc.) and the Rest of Africa. Surprisingly, South Africa is now clustered with these countries. Emerging vs. Developed Nations - Again this appears to be an over-simplification. There seem to be stages of development which is discussed in the next section. There are many more colloquialisms and I apologize for not commenting on all of them, these six are just the ones which I encounter most frequently in my everyday life. Please comment if you spot other interesting relationships. This ranking isn't perfect, but it reaffirms our beliefs that the world is an unequal place, and that the distribution of countries is skewed towards lower rank values. In other words there are more worse off countries than well off ones. This ranking also implies multiple stages of development for countries. The stage of development is inversely proportional to the real-GDP growth potential (countries in the earlier stages of development have greater growth potential) BUT the difficulty associated with unlocking that growth potential is also inversely proportional to the stage of development (countries in the earliest stages of development will find it harder to realize their growth potential). So what does that mean for investors? I think it means that distinctions should be made between countries in different stages of development. This is because whilst the most under-developed countries represent investments with the greatest return potential, they are also more risky and will probably require longer terms to pay off. Ideally these factors should be weighed against one another and compared to the investor's risk-return appetite. In the third part of this article series I am going to look at predictive models for real-GDP growth. The article will take a while to complete, because I am planning to implement a few models and also take a deeper look at the data. Are fractional distances sensitive to the scale of the vectors being clustered? What unbiased alternatives are there to the clustering quality metrics presented here. 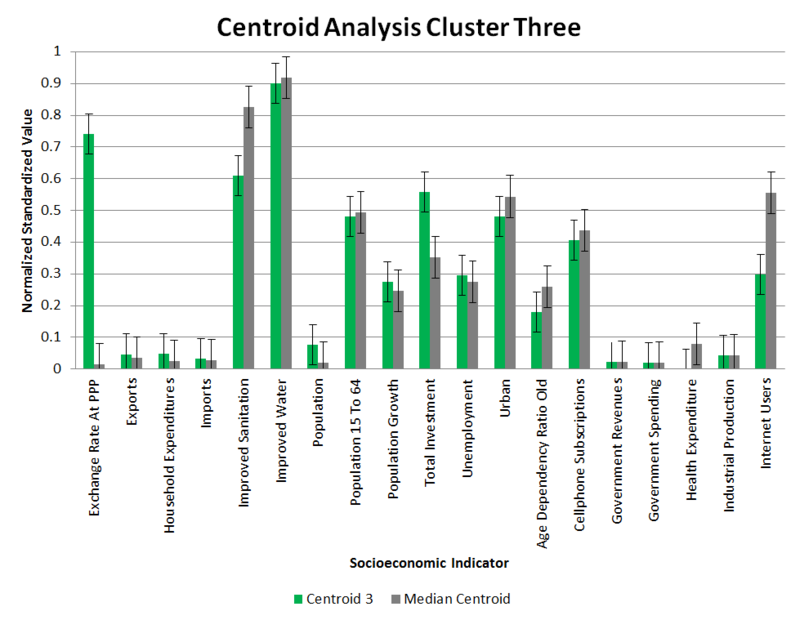 To which socioeconomic indicators are the clustering results the most sensitive? 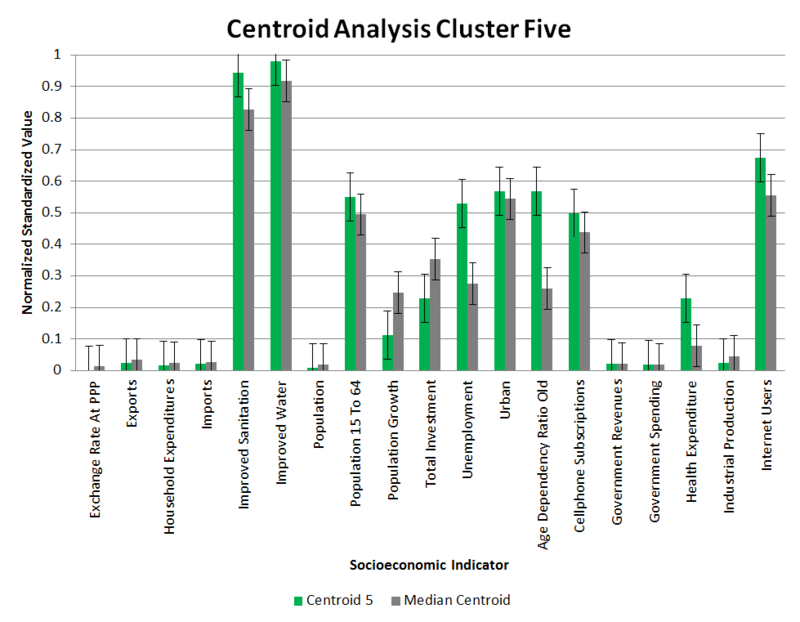 More detailed analysis of each cluster, and of particular countries in each cluster. I have removed the code from this article because of slow load times on the page. You can still obtain a copy of the Python file (in .txt format) and the data by following the links below. All the code I used to write this article is shown at the end. To run it you will need the raw data file; you can download a copy of it here. Please let me know if you can identify any optimizations, the code is already memoized to reduce the number on unnecessary distance calculations and (tries) to make use of numpy arrays over conventional lists. 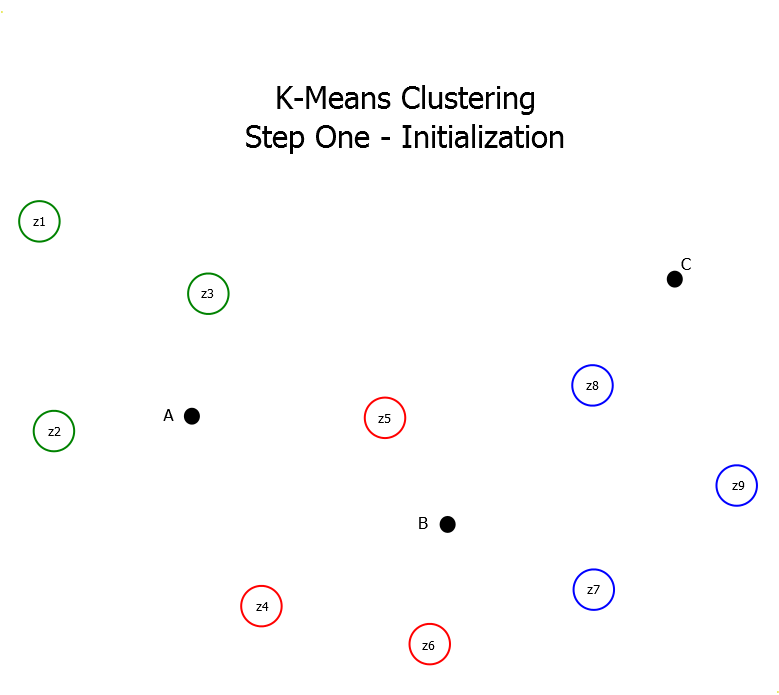 Probably one of the best explanation for k mean cluster and the way to assess its quality! Kudos! Well done! Look forward to part 3! Thank you for the compliment. I am glad you enjoyed it! Thank you very much for such a nice code!! I checked the code to ensure I did not make any errors and found none. Thank you for the kind words, they mean a lot. 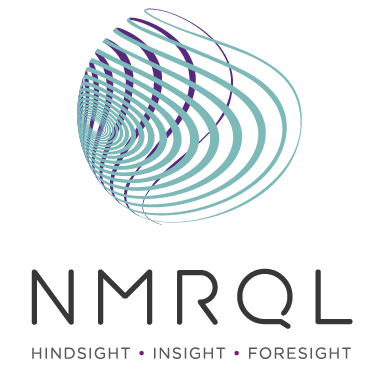 What aspects of Quantitative Computing are you most interested in? You're welcome. I am essentially interested in quantitative finance for energy markets, specifically short-term prices forecasts. Hence the biggest challenge to me is often to find relevant causality in the numerous price factors, which happens to be quite complex given the constantly regime-switching interactions between financial and physical signals..
A very detailed explanation with a practical application in finance/econ. Lots of value add, thank you for posting Stuart! Thank you very much Stuart! I have been learning a lot with your website! Thank you man. You're the best. You explain all the stuffs in a best way. Thank you for your KM cluster example. It is amazing. 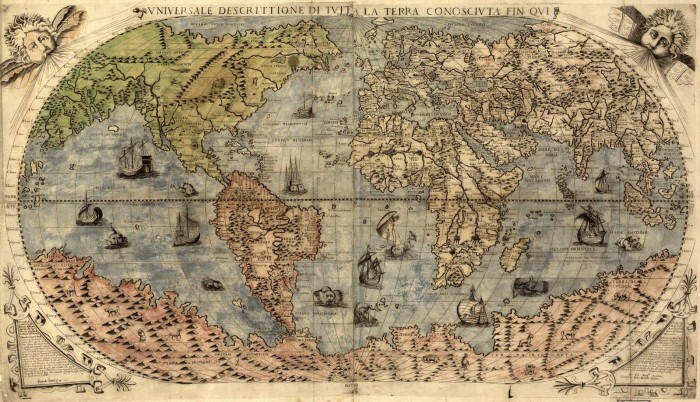 And I want to know what kind of drawing tools you use to plot the maps in the article? Nice figures and nice chart really help to visualize the idea.